Do you have a Triumph car of which you are particularly proud? In that case, it goes without saying that you will want to have any damage repaired as soon as possible. 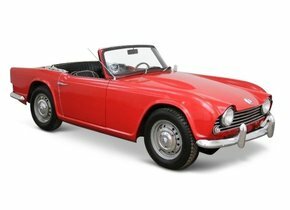 Owners of a Triumph car are of course very proud of it, not least because no cars of this brand are made today. However, it is always possible that damage to your car will occur. This damage can occur, among other things, in the windscreen of your car as a result of, for example, rubble. Do you also face such damage and would you like to have a windscreen replacement for your Triumph? Are you not only looking for a professional, but also for an economical partner? In that case, you will certainly be at the right address at Autoglas Concurrent! How can window damage occur in a Triumph windscreen? It is important to bear in mind that damage to your Triumph windscreen caused by rubble will always occur in the form of an asterisk or crack. This is not the case if there is damage to the rear or side windows. These car windows will then splash into countless pieces, but that doesn't happen with the windscreen. This has everything to do with the fact that the windscreen of a car is always made of laminated glass. This type of vehicle glass consists of multiple layers of glass with a PVB film in between. This film has an adhesive effect on both sides which ensures that the glass is held together well in the event of a breakage. In this way, an asterisk or a crack is created and it prevents you from getting glass from the windscreen in your face, for example as a driver in the event of an accident. The fact that a windscreen is made of laminated glass makes many people think. A windscreen replacement of a Triumph with a new one is likely to be quite an expensive issue.... or not? A windscreen replacement of a Triumph may indeed cost you a lot of money, but that certainly does not always have to be the case. It is important to be aware that a windscreen can be purchased in two different versions. The first option is to bring in an original new Triumph windscreen with a brand logo. When you choose this option, you will have to bear in mind that it has a fairly strong price tag attached to it. The presence of the logo ensures that such a car window may in the first instance only be sold by a trademark dealer. A windscreen replacement of a Triumph can also be done by means of a specimen intended for the after-market. In this case, the car window does not have a brand logo so that the price will be significantly lower. Many people fear that a windscreen replacement of their Triumph with after-market automotive glass is always accompanied by a certain difference in quality, but we are happy to prove the opposite. There can be no difference in quality between an original Triumph windscreen and an after-market car window. Not only the factory in which both types of windows are made, but also the production line is exactly the same. In other words, in principle, with a new Triumph windscreen for the after-market, you can simply bring an original car window into your home, but without it having a brand logo. Imagine whether you are prepared to pay such a high price only for the logo. More and more people are therefore choosing to simply use an after-market car window for a windscreen replacement from the Triumph. The windscreen replacement of your Triumph with an inexpensive one is already very nice, but of course there is more. Who will be responsible for the placement? A windscreen replacement of a Triumph is always done with us by one of our FOCWA certified partners. This ensures that the windscreen is replaced by a real expert, so that you can always count on the best possible quality in this area as well. In other words, are you looking for a very interesting party to outsource the windscreen replacement of your Triumph to another party, and you can also count on the most interesting price? Do not look any further and choose to order your new Triumph windscreen and have it installed by Autoglas Concurrent!